Time and money-saving Add-in for Microsoft Outlook - Outlook Duplicate Remover- will help you keep your contacts folder clean. Using a unique algorithm Duplicate Remover will detect and suggest Similar Contacts for merging. Contacts are considered to be similar, when significant part of important information matches or when there are two or more similar contacts due to spelling mistakes, switched or incomplete First and Last names and important fields in the Contact itself. Contacts like that can appear after synchronization, due to typing mistakes or just by accident. That creates a bunch of similar contacts, your contacts folder becomes a mess, which leads to a waste of time. Finding similar contacts and merging them manually is a time- taking and frustrating procedure. Outlook Duplicate Remover will do the job for you in a few seconds. 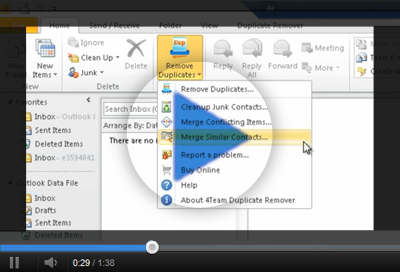 Open Duplicate Remover, choose “Merge Similar Contacts”, select the folder you want to scan and your part is done. In a few seconds, Outlook Duplicate Remover will show you the detected similar contacts in groups available for review and merging. Scan your Microsoft Outlook contacts in just a few clicks. Choose “Merge Similar Contacts” from the Duplicate Remover drop-down list on the Outlook toolbar, select a folder you want to scan and click “Search for Similar Contacts”. The process will be finished in a few seconds. Duplicate Remover will find all contacts that contain reasonable amount of the same information, or even the ones with spelling mistakes or incomplete names and they will be suggested for your review and mergence. You can add or remove contacts to be merged, select contacts that you want to merge to, and see the preview of merged contacts before merging. After that, all you have to do is just click “Merge”. In case contacts have matching information, but not really enough to be considered as similar, Outlook Duplicate Remover will add them to a “Suggested Contacts” list. 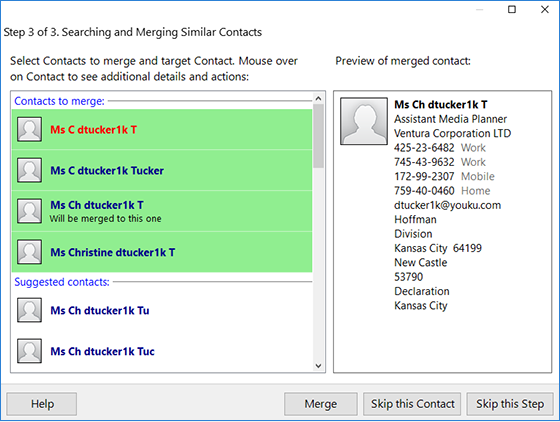 You can add the suggested contacts to similar contacts for merging by clicking “Add to Merge” and Duplicate Remover will merge them as similar contacts. Similar contacts appear in Microsoft Outlook from time to time and create a lot of mess in the Contacts folder. Outlook Duplicate Remover - is a tool to keep your daily work with Outlook simple, not wasting your time on frustrating manual procedures such as dealing with duplicates or similar contacts. Try NEW Mergix. Detect and merge all matching contacts that appear across Outlook, iCloud and Google accounts. The semi - automated tool will save your time while organizing your contact list: cleaning up duplicates, merging similar and removing junk contacts on all your devices and accounts. Merge all similar entries on your PC, iPhone, iPad or Android devices, by merging similar contact entries that appear across Outlook Exchange, iCloud and Google accounts. Click here to learn more about Mergix.